This was a recommendation from Diners, Drive-ins, and Dives... and it definitely is a random family run business away from mainstream Chicago. Located in the South Loop, Panozzo's is more of a deli/italian grocery that has a few tables for in-house eaters. They have sandwiches that you will probably not find at your local italian deli. I think it is a great place to grab a quick lunch but I will warn you that the sandwiches are greasier and vegetables are almost non-existent. There is not much seating so be careful if you are bringing a large group and want a place to chat. It is almost better to get everything for take out. One plus is that everything is made fresh. I would try this place out... BUT there is NO need to hurry. - I have returned to Panozzo's to explore their other sandwich specialties. Check out the descriptions of everything my brothers and I shared, and see why I raised my rating for their restaurant! This sandwich is huge. They are known for their Sicilian style meatballs and honestly, I am unsure what the Sicilian style means. Anyway, each meatball is about 1/4 lb. and it comes with three of them on the sub. It is then topped with their house marinara. I love the pickled banana peppers they throw on top... it adds a good spice and a different textural component to the dish. The meatballs are super tender, but you do notice the breading binding more than I am used to. Overall though this sandwich will fill you up almost to the level of uncomfortable. I suggest sharing it with someone and ordering maybe a side or two to share as well. I do wish it had a little mozzarella cheese... I thought it was going to but I guess it didn't. For only $3 more than the above meatball sub, I don't know why we ordered the meatball sub. Anyway, Panozzo's offers 3 different combos, each with a different combination of meats. We chose the one with everything... Italian sausage, 1/4 lb. of braised beef, and two huge Sicilian meatballs. It was all topped with their house marinara sauce and sliced pickled banana peppers. You can actually taste each meat when biting into this enormous sub. The marinara is perfect and the peppers give a nice crunch to the sandwich. I would order this one every time. One of my favorite italian appetizers... I first had an arancini in the streets of Pisa, Italy. We decided to order one and you could definitely tell it was Americanized... aka a huge portion that was over stuffed. Honestly, this arancini was large enough to be a meal and once again just oily enough to make me never want to eat the entire thing by myself. It was filled with veal and mozzarella cheese and topped with a fresh tomato sauce. It was crispy on the outside and the sauce was nice and tangy. It was a great appetizer TO SHARE.. not really to eat alone. I thought it would be a smart idea to order a cold side to break up all the huge, hot subs we ordered. The pesto pasta salad was tasty, but didn't provide much freshness that I wanted. It consisted of farfalle pasta, cherry tomatoes, and homemade pesto. I found the pesto to be very oily and not as thick as I like. It may be my personal preference, but my brothers thought the same. Definitely wouldn't get this side again. Saw this on Diners, Drive ins, and Dives and with 200+ positive reviews had to try it out. So porchetta is a pork shoulder roast that is wrapped in cured pork belly and generously seasoned with garlic, sage, and rosemary. 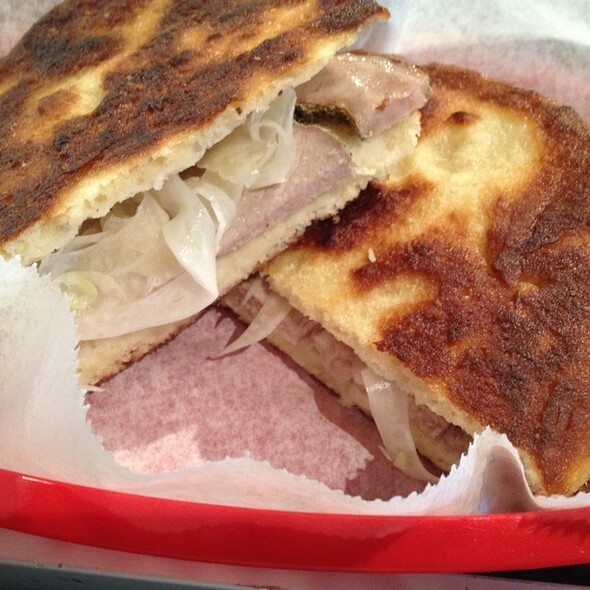 A thick cut of the porchetta is served on homemade crescentina bread. Honestly this is one of the best breads I've eaten in a while. It's like a fry bread so it's super crispy on the outside. but maybe a little too oily for some people. It is all topped with pickled fennel! Surprisingly, the meat wasn't well flavored. Luckily I thought the pickled fennel was phenomenal. I do wish it had something fresh... maybe some arugula and a tomato? Saw the name... Had to try it. 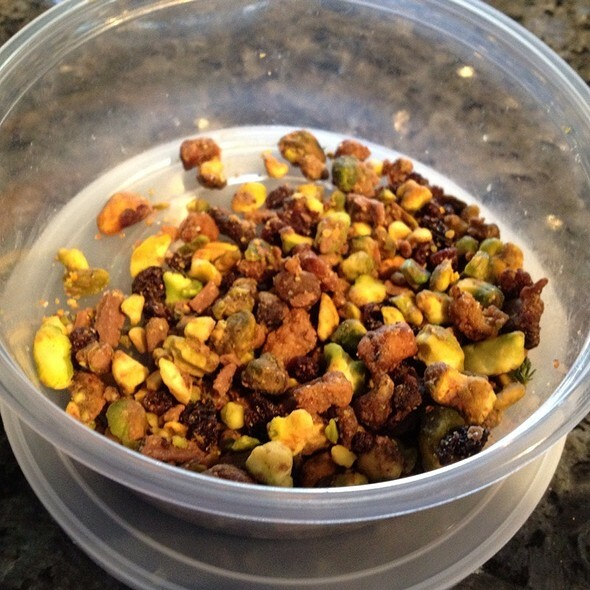 It is a mix of pork cracklings, chocolate chunks, pistachios, and chilies. Everyone that tried it wanted something else. I thought it needed more salt. One of my friends wanted it sweeter, and the other wanted it more crunchy. It's all preference I guess but for a trail mix it's pretty good. Nothing outstanding and probably nothing I would get again unless you could somehow customize your order. - How to order... Basically, walk up to the area with the deli meats/cheese/etc. You will see a very small menu so make sure to take your time. Then someone behind the deli will take your order. Then go pay at the cashier near the front door before you eat. I would also grab a seat right when you walk in because if not, you may be waiting around for a while to get grab one of their handful of seats. - Do ask them to add some kind of vegetables to the sandwich. I would definitely pay an extra buck or two to get some freshness involved. - Parking may be difficult unless you come on an off-time. Just warning you. - Don't get the "gelato" or any of the "italian sodas"... They are all pre-packaged and almost too frozen for the correct gelato consistency.